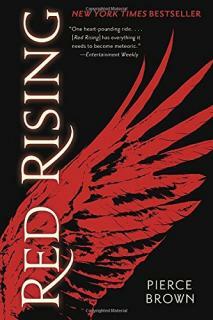 Yes, this book is as great as the first two Red Rising books. The bummer part of the book is that IT IS THE END OF THE SERIES. GDI! 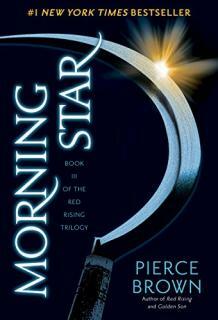 Morning Star continues Darrow's story, but this time, instead of being alone, he has friends. And oh boy does he tell about how much he has friends, about how his friends changed him, how they kept him sane, about how, no, he's not using his friends, they are making him a better person. The thing about that is that you have to choose your friends well if your friends are going to change you, give you support, make you a better person. Darrow (Brown) ignores this particular detail, as he chose honorable do-the-right-thing people to be his friends (even in the end), but it's still a bit of a "Huh" kind of message after I let the story sit a bit. That all said, loved the book. I recommend these books, the entire series is great. I'm still amused with myself for not immediately devouring the books. I would have to say that I wasn't in the place to hear the message, maybe? Action packed, lots of fun, and wow, didn't see that twist coming. Okay, this is book two of the Red Rising trilogy, and I have to ask myself again, "WHY DID I WAIT SO LONG TO FINISH THIS BOOK?" I swear, Luke is probably like, "WTF, Kitt, finish the book already. There's book three to go, too!" Hell, I'm thinking that now. I am full of Wow at this point about this series. The blurb is all about Darrow's continued saga as a Red in, well, his rising. How much do I give away in this review? I mean, the title is "Golden Son," so how much am I really giving away with the fact that the kid is a man and a Gold at that? What I really like about Brown's writing is the way wise words come out of a 20 year old's mouth. Doesn't really happen in real life, but does in fiction. Anyway, I'm diving into the last book next. Highly recommend the series. Really, the last one was the key. The first part of the book sets up, I presume, the full series. It takes a bit to fully set up what is going on, and why Darrow, the main character, is motivated to do what he does. Once everything has been set up, oh, boy, are we on a wild ride. 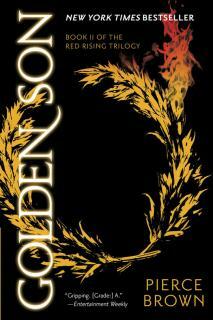 I enjoyed the book, and have Golden Son ready to continue reading. I've been warned it'll be gut wrenching, so I have prepared my gut to be wrenched and survive.